Measure out all the ingredients into a mixer bowl from an electric dough mixer. Using a whisk attachment, fold in the mix on a low speed (no higher than speed 2). Once all the ingredients are well combined, change the mixer speed to high for 2-3 minutes. The sponge mix should now resemble a thick, airy batter. Let rest for 10 minutes. At this point, choose whether you would like to make one large cake, as is traditional, or individual sponges in ramekins. If making one large sponge, set your steamer up by placing a steam stand or metal bowl into the base of a large stock pot, and then fill the pot one-third of the way up with water and bring to the boil. While the water is heating, grease the sides and base of a high-sided 18-20cm cake tin with a little butter or oil. Beat the batter once more to create a few larger air bubbles into it before pouring all the mix in to the greased cake tin. Place the tin carefully into the steamer on top of the steam stand, then cover with a lid wrapped in a clean tea towel, or with a bamboo steamer lid that fits on top of the stock pot, to stop any condensation from dripping onto the cake. 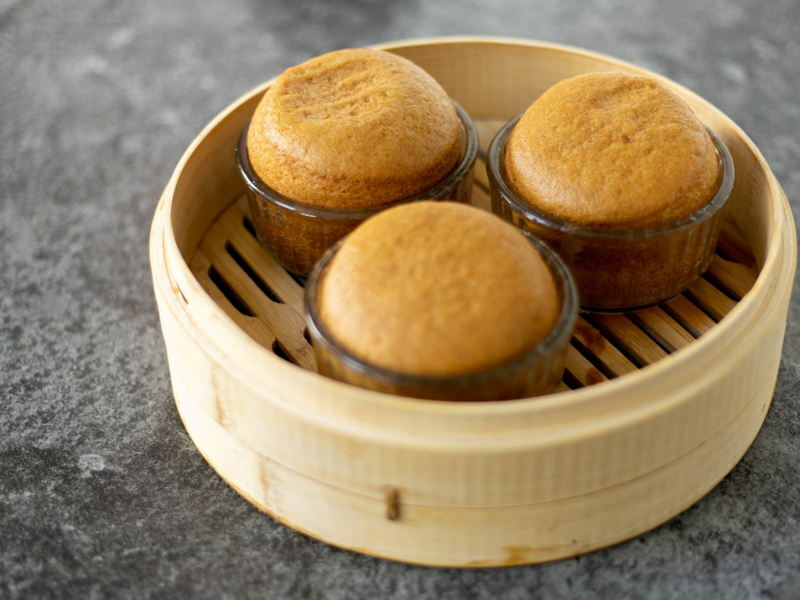 The next step, if making individual sponges, is to place the ramekins in the base of a bamboo steamer. The cakes require a lot of space to rise, so if your lid sits too close to the top of the ramekins, exchange it for the base of a second steamer, turned upside down, and then wrap the whole steamer in tin foil before placing the lid on top. You can choose to steam the cakes in a wok, a steam oven, or we recommend simply placing your bamboo steamer on top of a deep saucepan, filled one-third of the way up with boiling water. Steam for 50 minutes if making one large cake, or for just 25-30 minutes if making individual sponges. Resist the urge to lift the lid throughout cooking, unless you have to top up the hot water (in which case, do so quickly so as not to lose too much steam! ).